What is meant by an agreement? An agreement is an arrangement between two or more parties regarding a specific course of action. An agreement document is a formal document that binds the participating parties to all of the terms and conditions that has been agreed on. There are many different types of agreements being used in different industries today, especially in business industries. 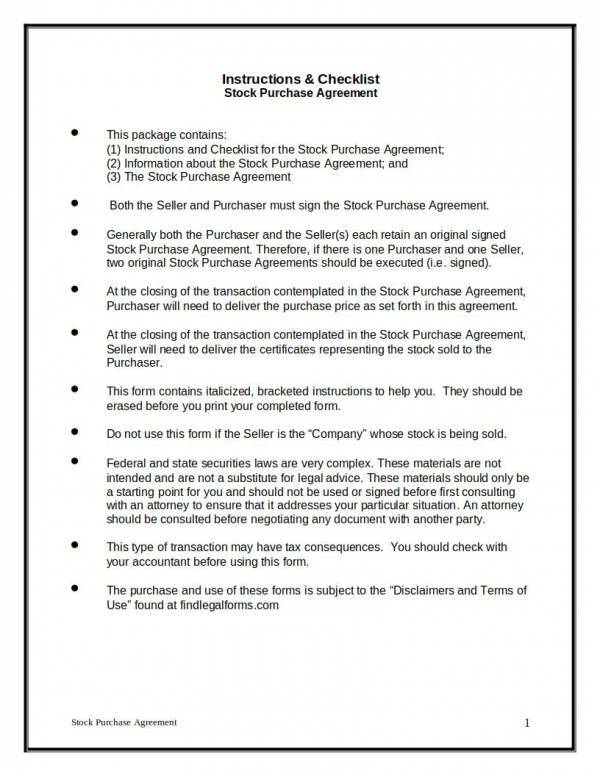 One of these agreements is a stock purchase agreement. 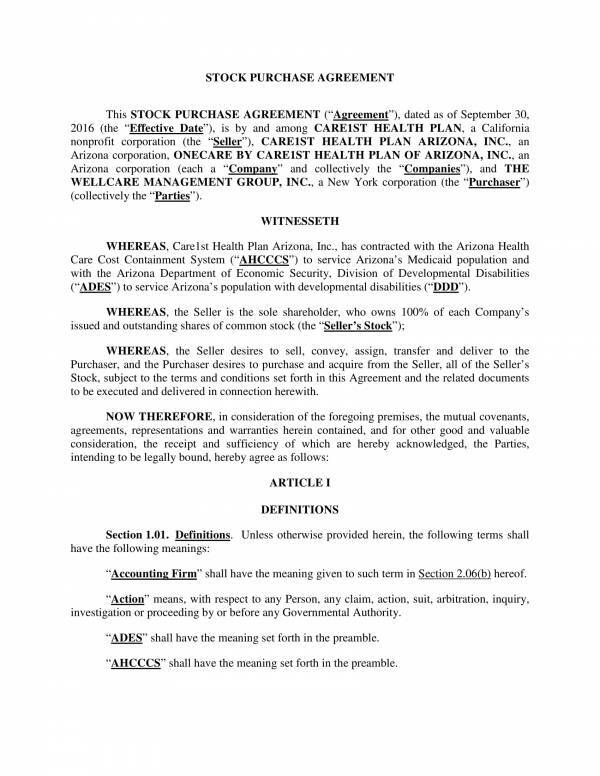 In this article, we will define what a stock purchase agreement is, enumerate its uses, determine its key provisions, and justify its importance. 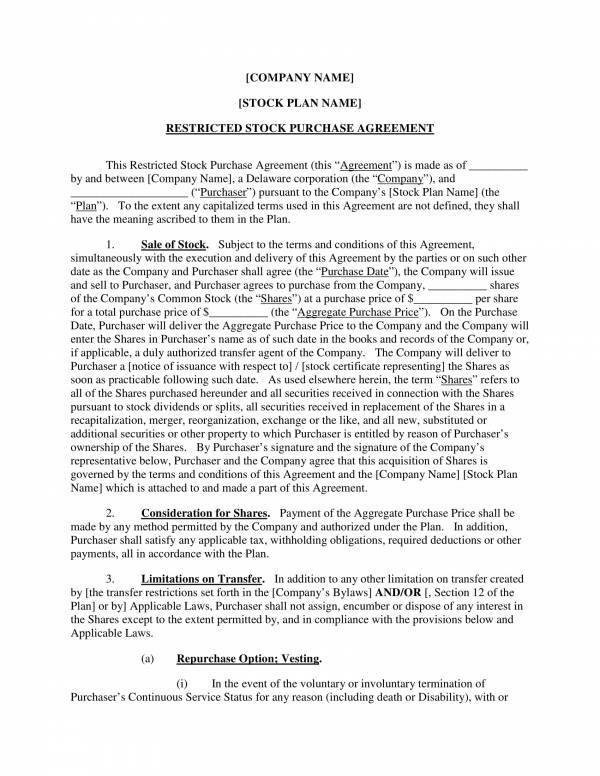 Stock purchase agreement template samples are also provided below. What Is a Stock Purchase Agreement? 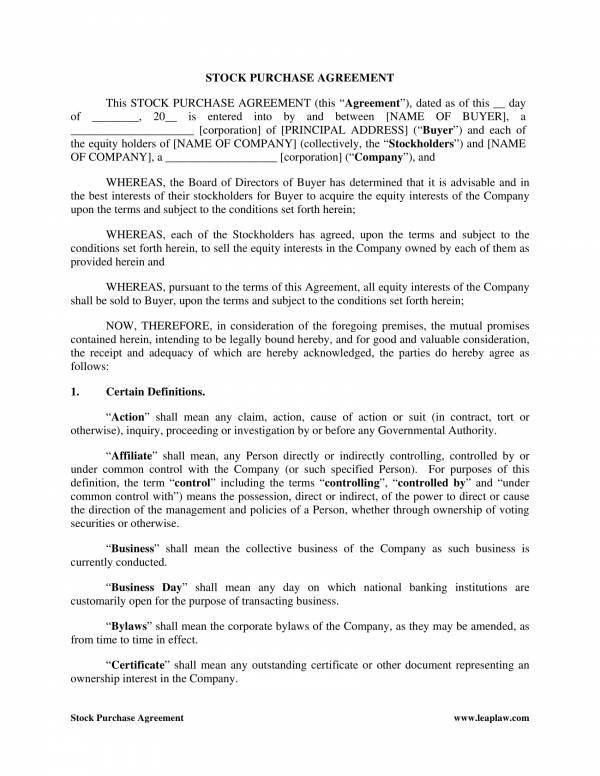 A stock purchase agreement is an agreement that is signed by two parties who are involved in the sale and purchase of company stocks. The agreement is legally binding and it is meant to protect the parties involved, both the seller and the buyer, in the sale and purchase of the company stocks. Small corporations often sell company stocks to raise money to be used on something or transfer ownership of their stocks. In the agreement, the company itself or its shareholders can to sell stocks to buyers. You may also check out other related articles, like Sample Commercial Real Estate Purchase Agreements and Land Purchase Agreement Samples. A stock purchase agreement is an essential document that is necessary for any transaction involving the sale and purchase of the stocks of a company. 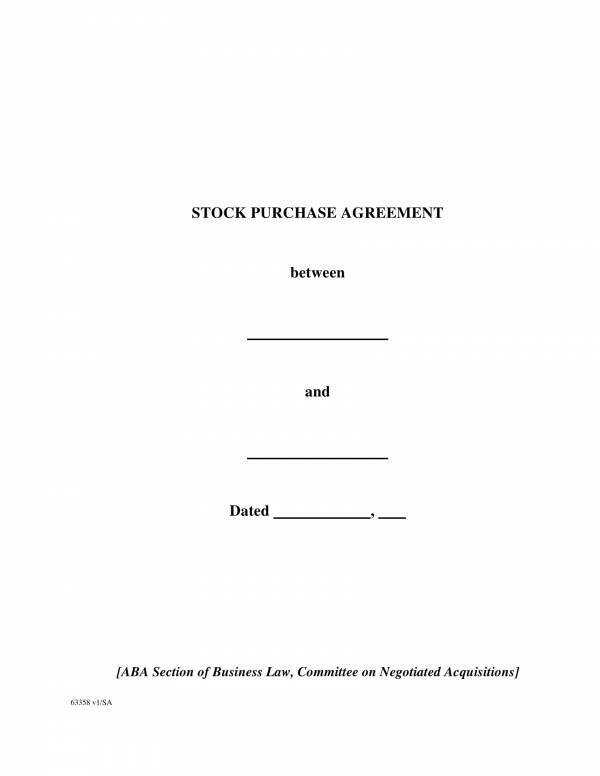 The following are the uses of a stock purchase agreement. 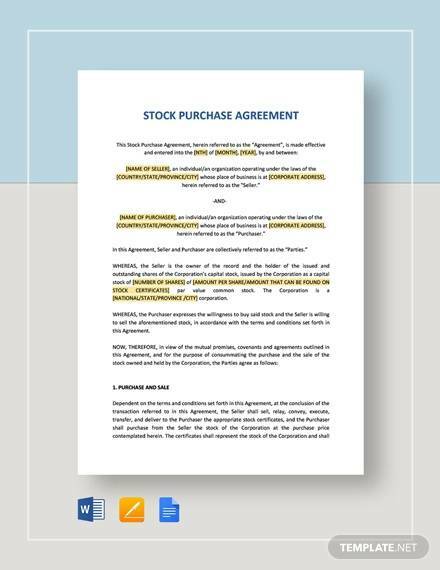 A stock purchase agreement records and documents everything that has been discussed and agreed on in the sale and purchase of stocks or shares. The agreement is used as a reference whenever some confusion or misunderstanding takes place. 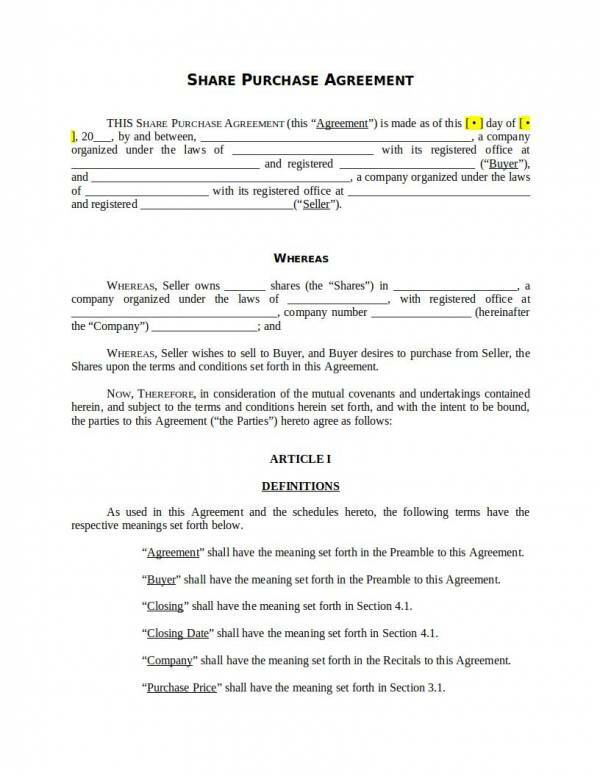 The document is where all the agreed upon terms and conditions can be reviewed. 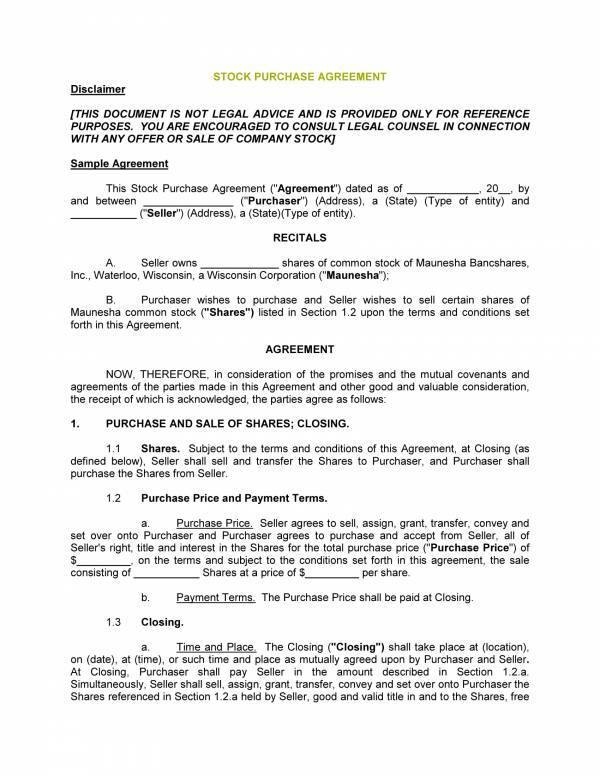 The stock purchase agreement is where payment details and payment terms and conditions are stated. 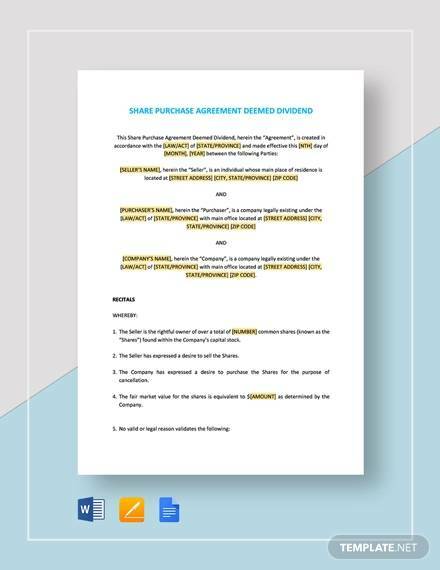 The agreement is used as proof that both the seller and the buyer agree to the provisions of the agreement and that they give their consent to be part of the agreement. You can use agreement templates to help you further understand and identify other uses of an agreement. Some articles you may find useful are Vehicle Purchase Agreement Samples, Free Lease Agreement Templates, and Separation Agreement Templates. What Are the Key Provisions of a Stock Purchase Agreement? A stock purchase agreement provides the provisions that has been agreed by both the seller and the buyer of the company shares. These provisions are important as they outline and specify what must be done by both parties with regard to the agreement. 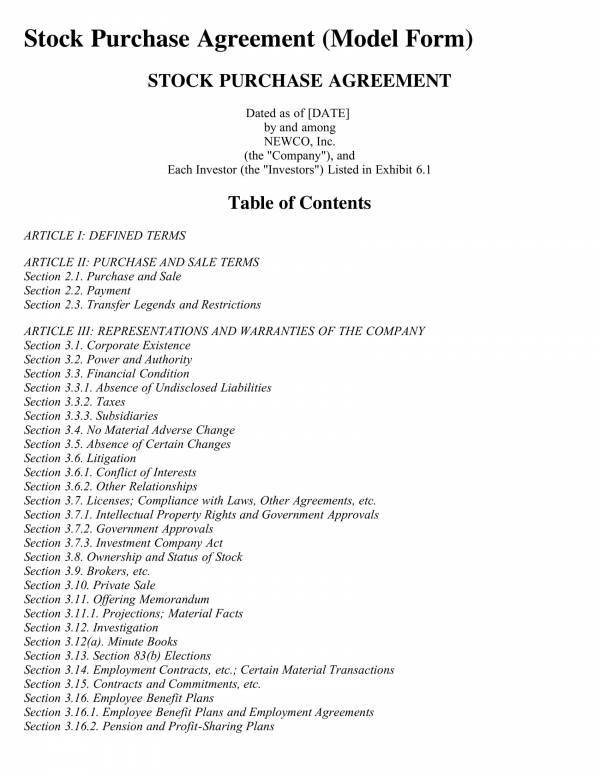 The following are the key provisions that are necessary in a stock purchase agreement. Date—This refers to the date of the agreement and includes the names of the two parties involved in the sale and purchase of shares. Price and number of shares—The name of the company or corporation selling the stocks or shares is stated in this part of the provisions. The number of stocks or shares being sold or involved in the transaction is also specified together with the corresponding value in dollar amount of each share. 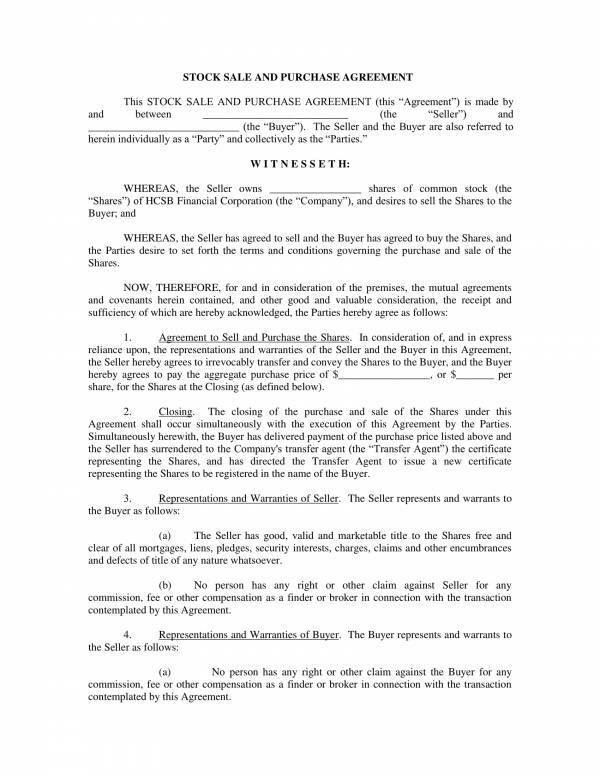 Sale and purchase—The sale and purchase provision includes the conveyance of the shares from the seller to the buyer at he end of the transaction. The seller prepares all the necessary certificates and transfers it to the buyer’s name. The buyer will have to pay for the transfer fees. Seller representations and warranties—The parties involved in the agreement knows, understands and agrees to everything that there is to know about the agreement, and that everything has been disclosed by both the seller and the buyer. General provisions—This refers to all of the basic provisions that must be present in the agreement and a statement about the compliance of the agreement to state laws or government regulations that are effective in the location of the transaction. Witnesses—There must be a witness in the agreement that swears an oath that the seller and the buyer has come to agree to the same terms and conditions in the agreement, and that none of them has been forced into the agreement. Payment terms and conditions—This includes the amount that the buyer must pay the seller, frequency of payment, costs for documentation and transfer of documents, and how much the second payment will be after the initial payment or down payment has been confirmed. These provisos can be found in different agreement templates. Using templates to become familiar with these provisions will greatly help you. You can check them out in articles, like Outsourcing Services Agreement Templates, Dealership Agreement Templates, and Service Agreement Templates and Samples. Why Are Stock Purchase Agreements Important? Agreement documents have always been considered as important and necessary documents in any business or personal transaction, especially if it has to do with money, properties, assets or business. The same is true with stock purchase agreements. What are the reasons why this is so? One of the main uses and main reasons why a stock purchase agreement is important is because it puts everything about the sale and purchase of shares into writing. A written agreement is the best evidence one can have to protect themselves from fraud. The agreement document is used as a reference to prevent misunderstanding and can be used as evidence in court. A stock purchase agreement is legally binding, which means that it is enforceable in the court of law. Once the parties are bound by the agreement, they have an obligation to strictly follow the terms and conditions. 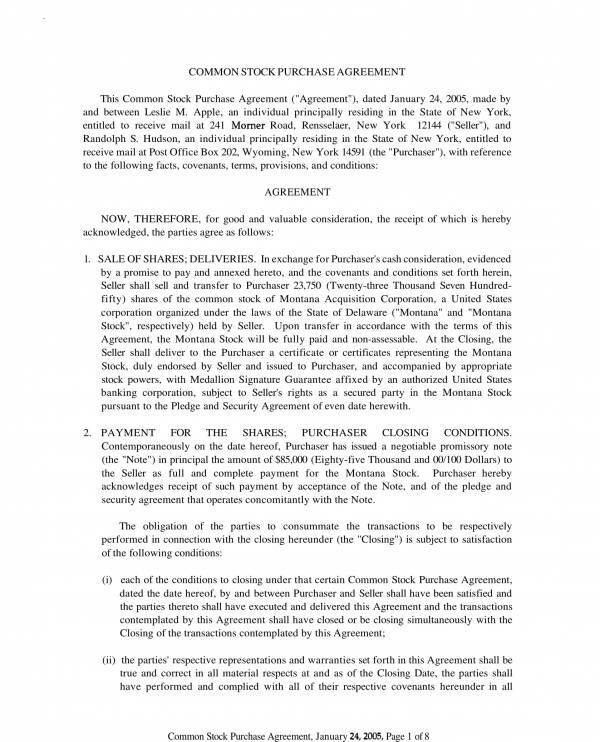 The agreement allows the seller to clearly explain their ownership of the stocks or shares being sold. Through this, the buyer gains more trust for the seller. 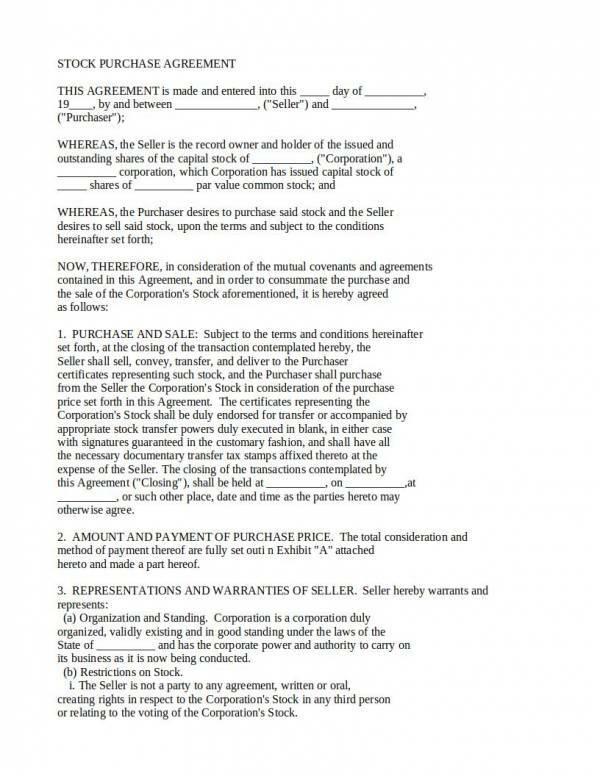 The agreement helps the seller get paid and the buyer to get the needed certificates. The provisions of the agreement includes payment conditions and the responsibilities of each party within the transaction. A stock purchase agreement details the warranties guaranteed by the seller and provides a list of measures to resolve issues within the agreement. Those are some of the reasons why stock purchase agreements are important. Some of those reasons are applicable to other types of agreements. Other related topics you may be interested in are Sample Purchase Agreements for Business, Sample Car Purchase Agreements, and Exchange of Shares Agreement Template.